In this ecologically and craft-friendly project, students choose how they want to observe and change their own behaviors towards the environment. Students will choose from one of 3 options- Upcycling, Choose a Change, or Chart Your Own Course. In "Upcycling", students work solo or in groups to create new items out of old and prepare their products for sale at an Upcycle/Craft fair. 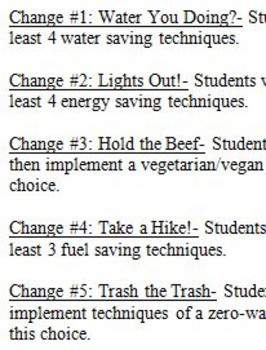 In "Choose a Change", students work with their families to reduce their environmental impact through a change in fuel, water, energy or animal product use or through the amount of household waste they produce. In "Chart Your Own Course", students develop a unique project with their teacher that meets the goal of raising awareness of human impact on the environment. Product includes Project Outline and Grading Rubrics. This project is great for middle-school students who want to flex their creative muscles or who want to make a difference in their own way. We originally created this project as a fund-raising idea. At the end of the project, students will sell their creations either at booths or in a Silent Auction to parents and family members and money collected goes to school programs. If this does not work for you, you could have the students "buy" items from each other and build in an economics lesson as well.